"Use any cut of steak when making this easy beef stew. Marinated in oil, oregano, vinegar, and onions, this is a great meal for a busy weeknight. A staple in Puerto Rican cooking. 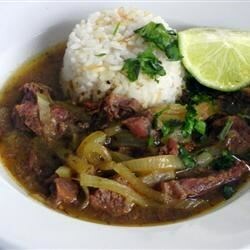 Serve with white rice and tostones. Water can be used in place of beef stock if desired." Very authentic tasted like my mothers. I felt the marinade was not a enough so I added two cups of broths and 2/3 cup of vinegar. my hubby is puerto rican and he doesnt cook so I'm looking for recipes for him. he loved it!! thank you so much for this recipe!